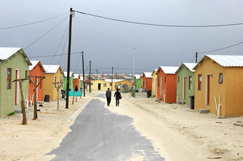 Things are happening in Khayelitsha, Cape Town, one of the country’s most famous townships, thanks to the City of Cape Town’s Mayoral Urban Regeneration Programme (MURP), which is aimed at improving the lives of its more vulnerable residents. The City is positioning the populous township as a one of its strategic investment zones. According to information from the City of Cape Town, in the Harare area of Khayelitsha, 17 capital projects have been implemented to date to the value of about R100-million. The infrastructure and facility investment, driven by the Violence Prevention through Urban Upgrade programme and the city’s partners, which form part of the MURP, is based on community engagement and involvement. The Investments have been focused around the main pedestrian routes between Khayelitsha Station and Monwabisi Park informal settlement. One of the positive results is that private sector partnerships, such as Grassroots Soccer, loveLife and Mosaic, have also been unlocked. These partners are helping the city to extend its services to this community.